Technology in the Backcountry – How Much is too Much? Here’s a recent blog entry from Philip Werner, who is the force behind “Sectionhiker”. Philip’s post captures the dilemma of electronics- why, when, and why not. Check it out and then read my response, which will include the electronics that I plan to take on my April 2013 CDT thru-hike attempt. Technology in the Backcountry – How Much is too Much? | Section Hiker. I have no dilemma-I favor electronics. There, I’ve said it. I like to write. I do it every day. The bulk of my professional time is writing or gathering information about cases that have to be detailed, precise, and succinct. On my down time, I write about hiking, biking, what I read about and what I view about biking and hiking. Since 2008, I’ve plugged away at my blog, which has enabled me to meet and sometimes hike and bike with people who I would have never met if I hadn’t taken the time to do it. Slowly, it all adds up. There comes a point where the cumulative hours that put into this work cluster into a massive snowball that gains more size as it rolls down the mountain and then it’s bigger than we can imagine. I have more than a half-million hits on the four thru-hike Trailjournals, and my WordPress blog just pushed 139,650 hits from 590 posts. I also enjoy the process of sharing my thoughts with others, and then experiencing the surprises that come out of my efforts. On the PCT, my daily efforts at writing and then sending out into the universe those parts of myself generated connections that were surprising in their multitude. It was as if the loaves and fishes were raining down from the sky. I do remember one weekend in Oregon where Megatex and I had three offers of trail magic on the same day. It’s insane to tell someone who wants to help you that you have already filled your dance card. Mega changes have already taken place within the last decade that have allowed the wilderness writing process to become easier. In 2010, for my Pacific Crest Trail hike, I replaced the Pocketmail /land line system with a Verizon MiFi device and an iPod Touch. The MiFi transmitter weighed 5 oz (including the charger) and the 8 Gig iPod Touch 4 oz., a system that allowed me more independence in posting online reports. Before I put the system into work mode on the trail I practiced entering data via the on-screen keyboard, using my two thumbs. The Touch added a voice recording option, via the Dragon Dictation app. After recording, I edited and then emailed right from the device. 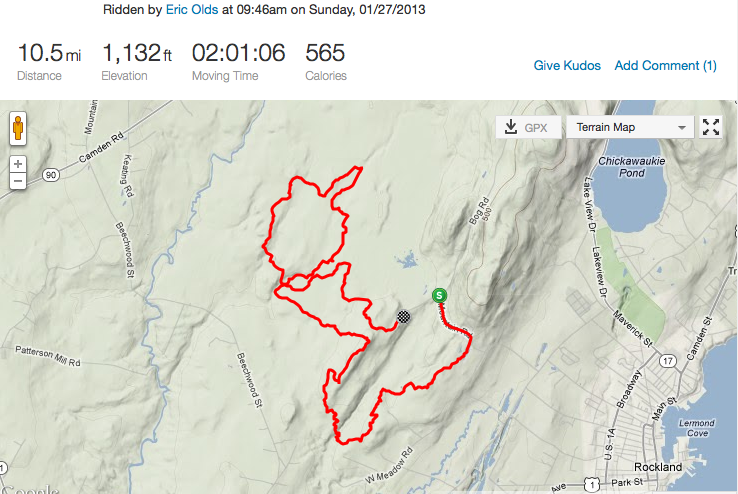 I was also able to clipboard the result into my Facebook, Trailjournal, WordPress, or Twitter posts. It is a rugged little system, standing up to extreme weather conditions and the sort of regular neglect that befits a thru-hiker. The system was one of only three things that didn’t break, tear, or wear out on that hike. The other two were my Western Mountaineering 20 degree down bag and my Bushcooker LT1 multifuel stove system. In November of 2011, I replaced the MiFi/Touch system with an iPhone 4S. My MiFi contract had expired and I was able to upgrade to the iPhone at a big discount, although it’s costing me about $94 a month versus the $50 a month plan I had with the MiFi. I plan to use the iPhone as my primary electronic device, but hike with it shut off, except to write, and then to send and receive messages once a day. Additional electronics: I’ll have a digital camera, with a spare battery and charger. I will carry a Garmin eTrex 30 GPS. I have had good luck with my classic Solio solar charger, which can give the iPhone, and a couple of almost weightless iPods additional charging. The iPods have music and audiobooks on them. I am not sure which headlamp I’ll take. I have three. Of course there will be headphones. There were so many Bubbas and guests on their bikes in the frozen Bog this morning that I lost count. Jason thinks there were 16. There were so many of us that the group broke apart right at the start, with most of us backtracking the Bog Road for the climb up Benner Hill into the trails that led off the powerline on top.I do know it was a Bog record, even bypassing the numbers from the three warmer seasons this year. Why? Surely it was not the conditions. It was 11 degrees out, and in the open sections like the power line, there was wind as well, driving the wind-chilled temps into the single numbers. How long was the ride today? Depends on who you were with. Nelson and I were toast after just 5.7 miles, but Jon Anders put up 7.1, Eric checked in with 10.5, and the Hawk trumped all comers with 12.1. These were not summertime miles. They were mostly hard earned. What were the riding conditions? There were places where the packed and refrozen snow settled down over rock gardens and evened them out, making travel zipper than usual. However, some things were more difficult, like finding the trail. John and I found ourselves off-trail descending the first section from the power line to the wooden bridge over Branch Brook. Without a defined trail, the deep double-rutted ATV tracks led the way, but sometimes it was the wrong. 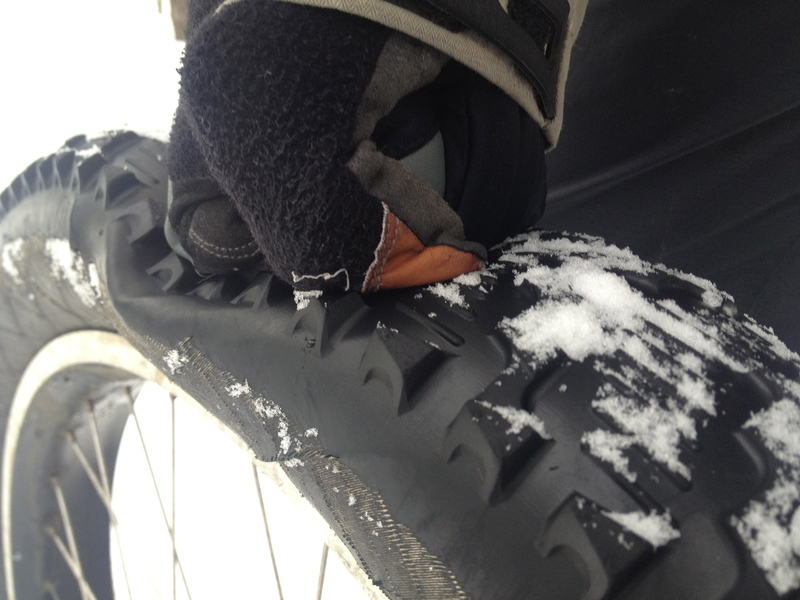 The absolute best assistance winter bikers can get on their favorite trails is from snowmobiles, who pack the trail evenly, and if that surface is refrozen, it’s generally easy to stay on top and not break through no matter what type of tires you have on your bike. ATV’s left a narrow berm between the two icy tire tracks that were just deep enough to catch my pedals when I tried to ride in the slots. When I was in the berm between, refrozen footprints and deer tracks lumped things up and sometimes threw me back into the ruts. There were a few sections of trail that were sheer ice, and the guys who were riding studded tires were able to go straight over them. Fat tire bikes had an option here, which was to pull off the trail, head right into the woods along those sections, and pick your way around trees to rejoin the trail after the ice receded. I did this successfully a number of times. 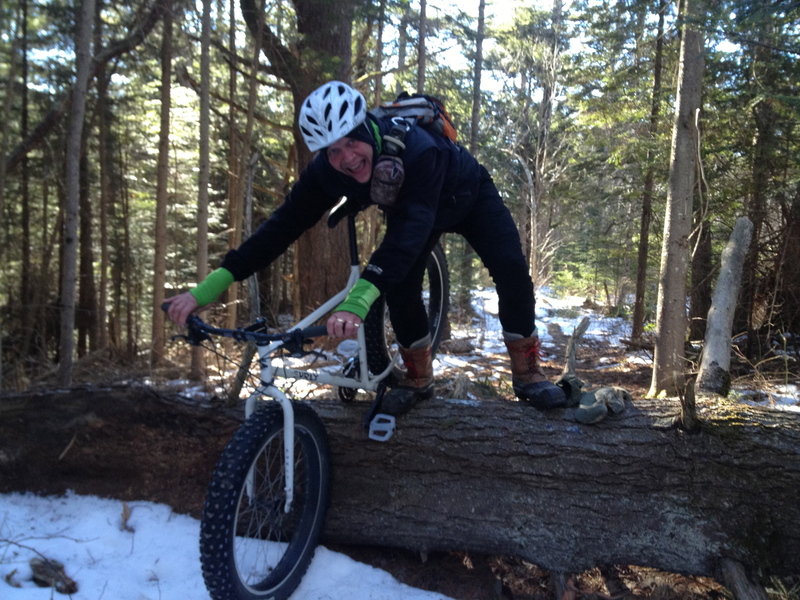 Climbing out of Branch Brook, there was the biggest blow-down we’ve seen yet this year on this ride. And finally, here’s the real deal- footage of today’s ride posted by John Anders mixed in with a ride that John and Tim Sewall took on the Warren trails the day before. The Friends of Baxter State Park give away 8-9 day backpacking trips within the park every summer. That’s why I donate to them. Please get the word out to fill these applications! Feb. 4 deadline approaches for Maine Youth Wilderness Leadership Program – Act Out with Aislinn – BDN Maine Blogs. 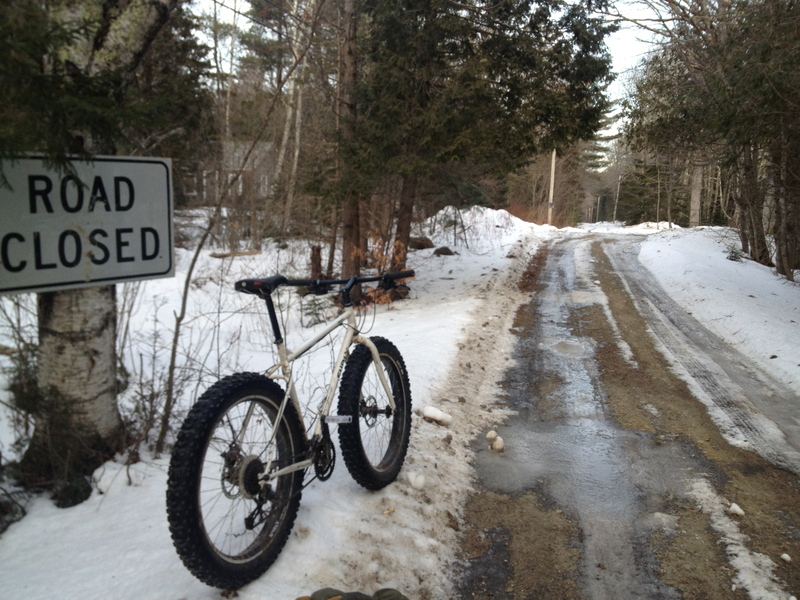 Finally able to ride my Pugsley at a decent clip over the snow. We’re on the front wave of the coldest January temperatures since 2009 that are creeping here from Canada. 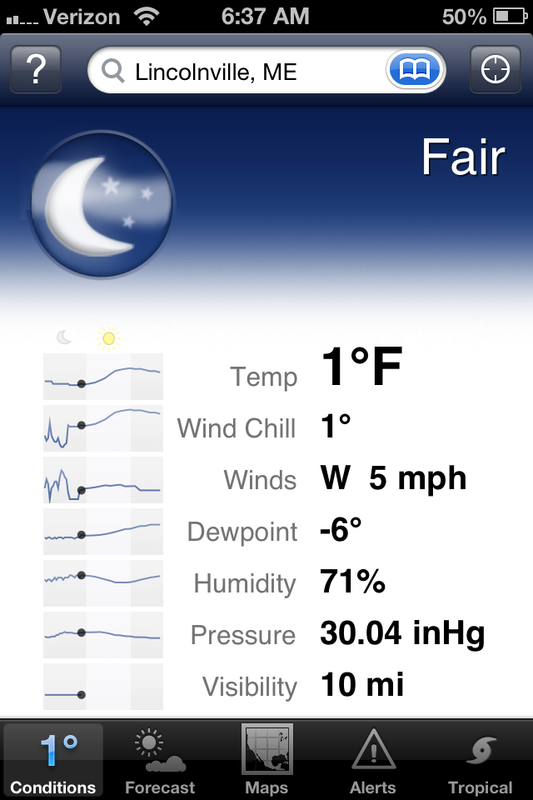 It’s going to head down below zero for the next three days, with an accompanying windchill. We’ll stay warm here, with wood/coal stoves in the kitchen and living room, fueled by bone-dry hardwood and the secret weapon- a few hundred pounds of coal that I’ve stashed away for nights just like these. The snow under the Nate tires is still crunchy, but the effort to move through it is minimal. I am tired of cold feet on my winter rides. My clipped Lake winter riding boots aren’t cutting it. Craig Nelson loaned me his socketed 6 mm allen tip that allowed me remove my Time pedals, and replace them with a set of plastic platform pedals that I bought for $12 a pair at Bath Cycle. I rode with this setup yesterday, which enabled me to wear my over sized and unlined New Balance hiking boots. The extra room in the toe box lets me wiggle my forefoot around, and allows for the small chemical heat packets to be thrown in there as well. I was definitely warmer with this pedal setup. 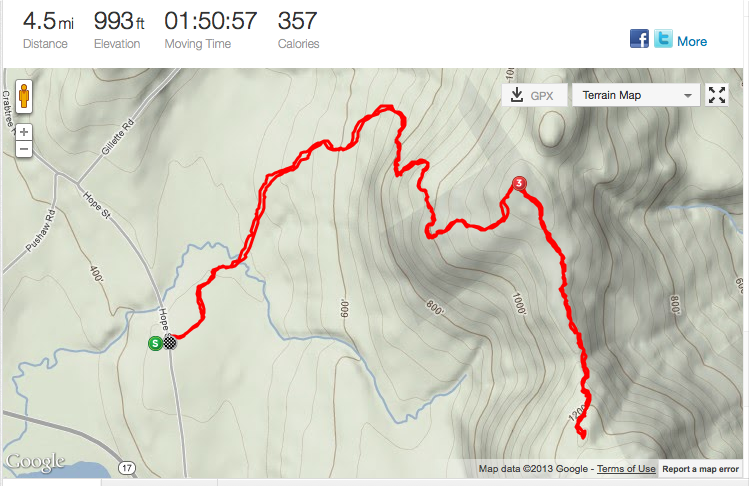 Super fun bike run yesterday afternoon, riding from the house up on High Street a few hundred yards where I turned down the abandoned end of the Proctor Road and then I linked up with the snowmobile trail that wound its way around Moody Pond reaching Moody Mountain Road. When I got to the end of the Martin Corner Road, I took a picture of my bike on the road back. You can see this is a driveway that turns right, but I’m headed over the snow berm straight ahead that runs a mile or so back to the trails. I heard some voices on the road, and lo and behold, there appeared Casy and Chad, on their own fat-tire Pugsleys. They were running a snowmobile trail out toward the Hope general store, and joined me for the ride back, where they continued up the other end of the Proctor Road, branching off to the snowmobile trail that led them back to their cars at the Lincolnville School lot. I got onto new territory with the Pugs at the end, continuing on the trail, where I followed tractor tire depressions on the snow where I climbed through my next door neighbor’s fields, coming out back on High Street, adjacent to the Cross cemetery , and back to a warm house. Traffic report:cars seen on this ride = 0, Pugsleys 2. 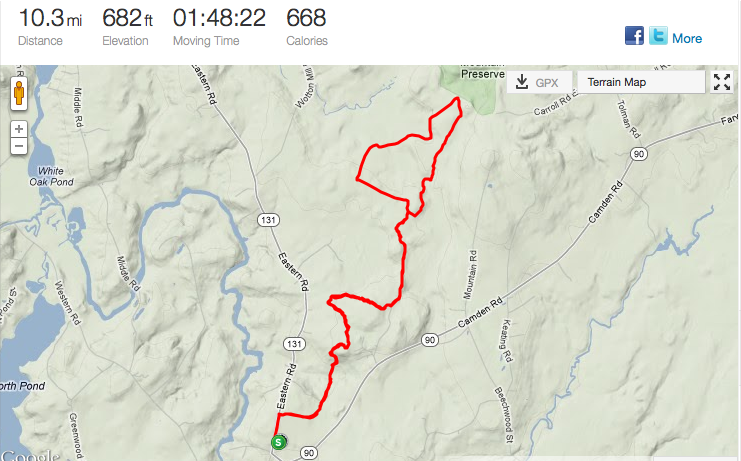 Here’s the map and stats, courtesy of my iPhone and Strava. Initial report of avalanche that occurred yesterday at 5 PM in Huntington Ravine. Concerns about danger on thin ice in lakes and ponds in New England now extend to winter hikers. See for yourself. Check out the following 2 hour and 28 minute documentary from Simon Cook, trail name- Cookie. He describes himself as a designer, illustrator, and occasional adventurer. It’s no nonsense, no in-town footage, no dumb stuff. I like the way the sections of trail are broken down into mileages, wih accompanying dates of travel. 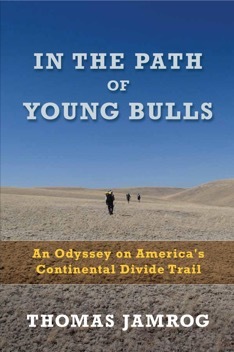 Continental Divide Trail – 2 Hour Version from Simon Cook on Vimeo. I enjoyed the video for a second time last night. 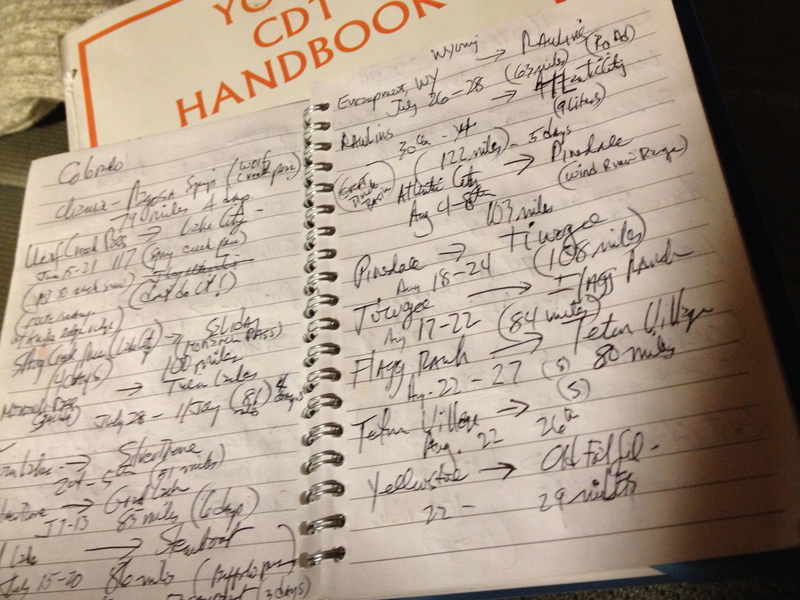 I took quick notes ( thank you, pause button) and then spent a couple of more hours with Yogi’s CDT Planning Guide . I have come up with a tentative list of eight food/supplies/batteries packages to send to myself along the 3,000 CDT. Those eight boxes will hold 40 days worth of food, at an average of two pounds per day. That leaves 110 days of meals and supplies that I’ll obtain by walking off the CDT and then hitching or walking into varying levels of resupply options, ranging from full-blown emporiums like a large supermarket in larger towns to gas station/convenience stores with you know what ( candy, chips, pastries, Slim Jims, canned food) to fill up the backpack and the stomach. Coming up on the 2013 CDT Action Plan is putting together a Mountainhouse Foods order for those 40 days worth of meals. Excellent snowshoeing conditions are going to end. It’s been great, white, fluffy, deep. I have been out four times in the past week or but showers and forty degree temps are expected for the next three days. It’s a primal shuffle that you get into out there, a gait that has been practiced for thousands of years in this part of the world. Snowshoeing is more difficult than regular walking, while still a satisfying way to move about the winter country. Sectionhiker just posted an excellent, brief, and accurate Beginner’s Guide to Snowshoeing. Required reading ! Last night, it was cold, with winds up to 25 miles and hour. Rick and I were there by 5 , decided to head all the way up to the top, and felt we could be out by 8 PM. We never reached the summit. On the way up near the top, we missed a turn. The trail petered out and we realized we were truly bushwhacking. At this point we had been out for close to a couple of hours, the temps were dropping, and my headlight was not burning particularly brightly. So we backtracked our way back down. Here’s a bleak (but brief) video clip from that point. Rockin’ time riding the Pugsley for double digit ( barely) miles near Warren village. 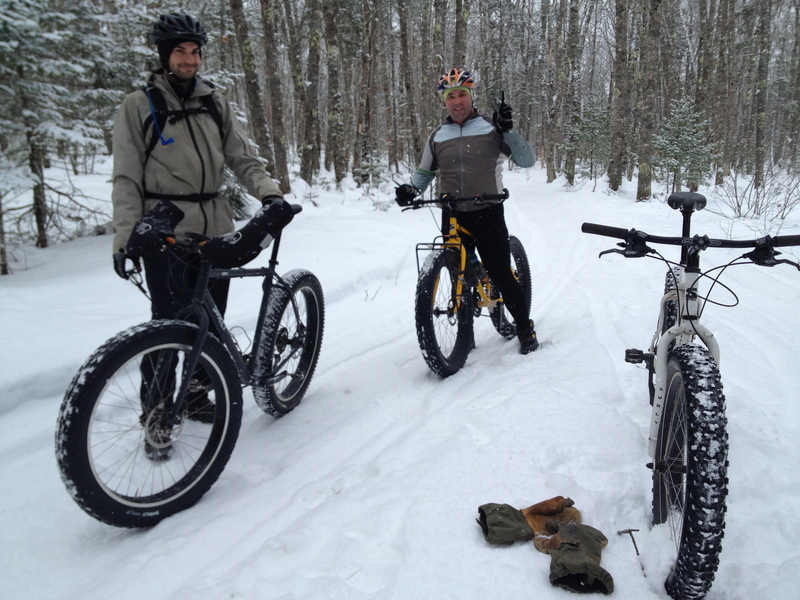 Four of us were on fat-tire bikes, with four other Bubbas bicycling on regular-width tires. It was 24 degrees out, with an inch of new powder settling on the snowmobile-packed trail. After my disappointing experience around Moody Pond yesterday, I hoped for a firmer riding surface. We had Casey join us today on his shiny yellow Pugsley. He and Jason were the forward force on the ride away from the Warren school. Here’s Youtube clip of this ride that John Anders put together and submitted. He’s doing a great job with the Contour camera and the editing. It’s not a flat fattie. Sinking was enough a problem that several riders labored back after an hour, at the 2.6 mile mark. 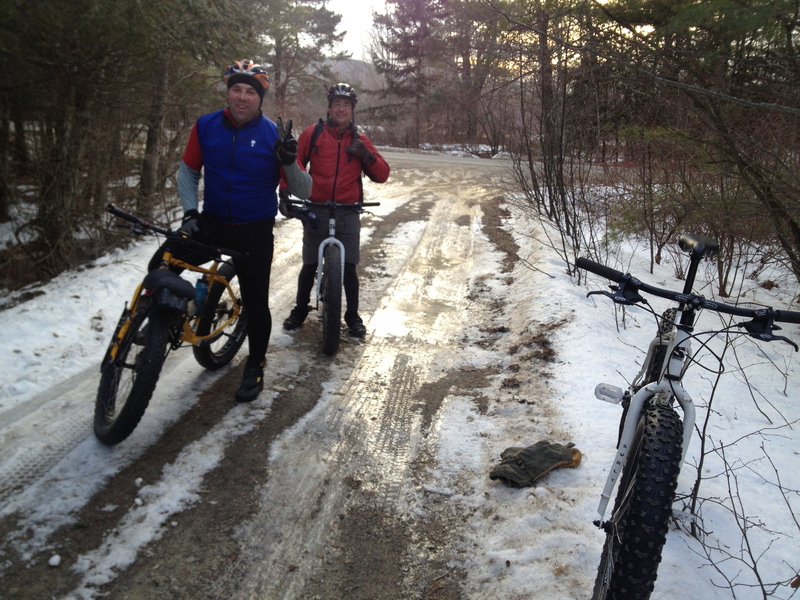 I joined Casey, Jason, The Hawk, and Craig Mac for an additional loop that added another 45 minutes to our ride. The terrain was varied. We even passed through a gravel pit. 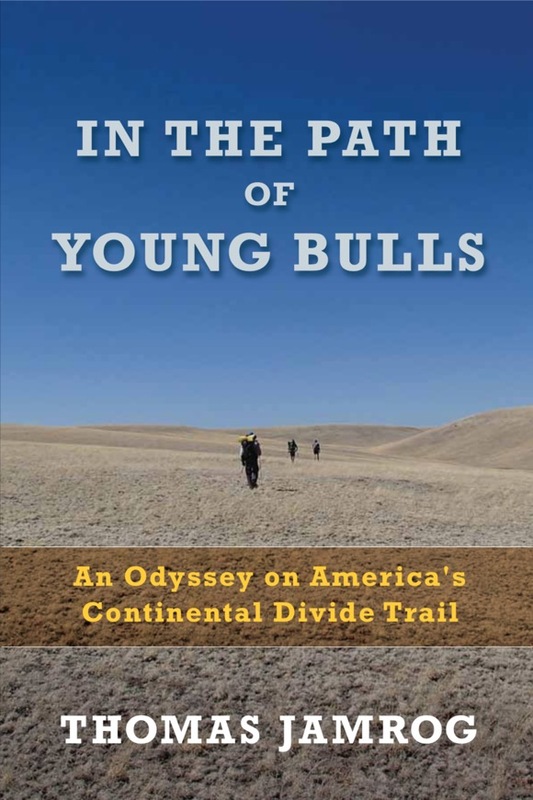 I was unable to negotiate a steep downhill curve at speed and even though I was nearly upright as I staggered to regain my balance, as soon as I stepped off the trail onto the deep snow beside the pack I face planted into the soft snow. With 40 degree temps predicted for Wednesday followed by two freezing nights, the winter riding is only going to get better. 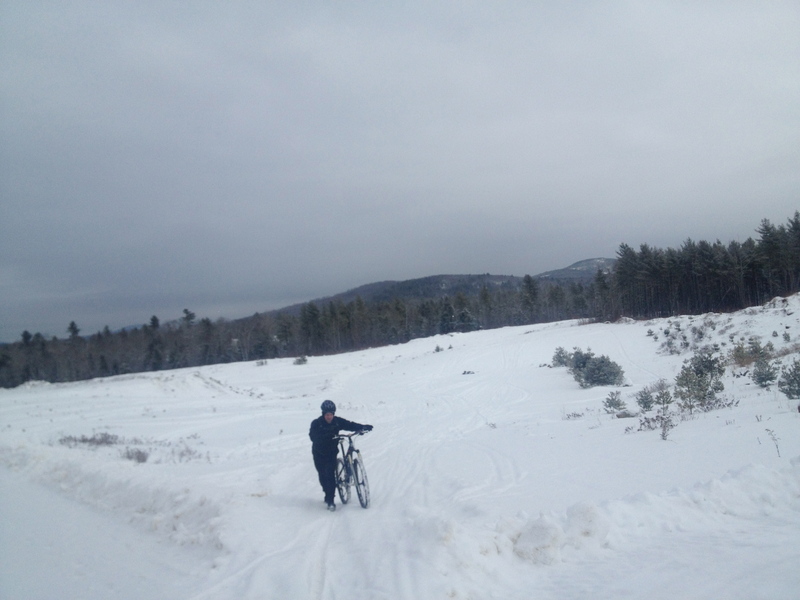 Since posting the my first Continental Divide Trail entry last week, the outdoor conditions here in midcoast Maine have dramatically, but not unexpectedly, ramped up. In the past week, we’ve experienced unseasonably low temperatures and 18 “ of snowfall. It’s made for challenging training conditions. There are hikers who believe that the only preparation for hiking is- well, to hike. On the other hand, some folks actually “plan” to show up for a thru-hike out of shape. They start really slow, generally grunting through less than 10 miles a day, and allow themselves to shed weight and build up mileage so that they’re in decent shape by week 4 to 6. I don’t want to be in pain and suffering when I’m just starting out, so I train. I don’t escape the discomfort and strife, but spread it out over a longer period of weeks, rather than add additional stressors at the of start of a long hike. This week, I’ve re-read Andrew Skurka’s recommendations on training for a long hike. <—Recommended reading. 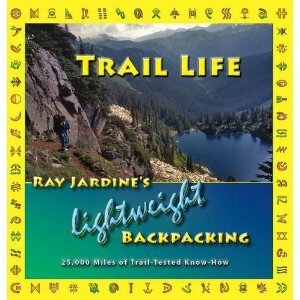 I’ve also revisited Ray Jardine’s Trail Life, specifically Ray’s excellent chapter on physical conditioning. My ultimate goal is to follow Ray’s recommendation to work up to walking on rugged terrain for 12 or more miles with thirty-five pounds on my back. I have a setup with a 50 pound barbell plate that I strap to an old Trailwise pack from the 60’s that I’ve put into rotation before. 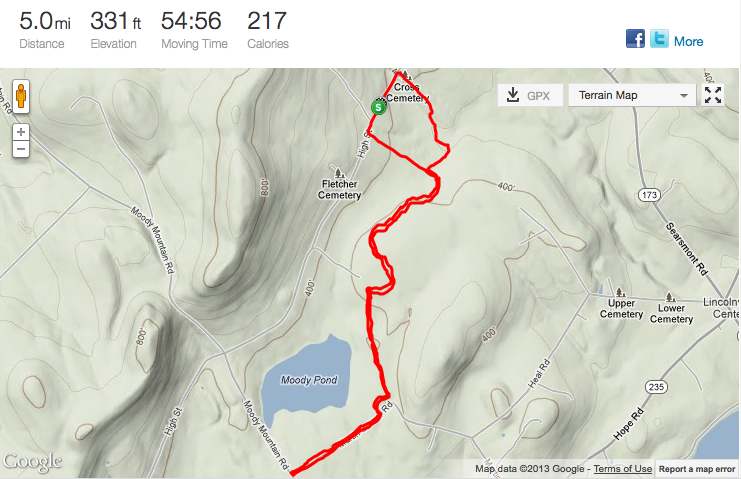 The Camden Hill State Park is a superb terrain to do backpack. I can see the top of those Hills from my kitchen window. At his point of my life I train every other day. I find I need to rest in between, – ok, maybe I do walk two or three miles in between. 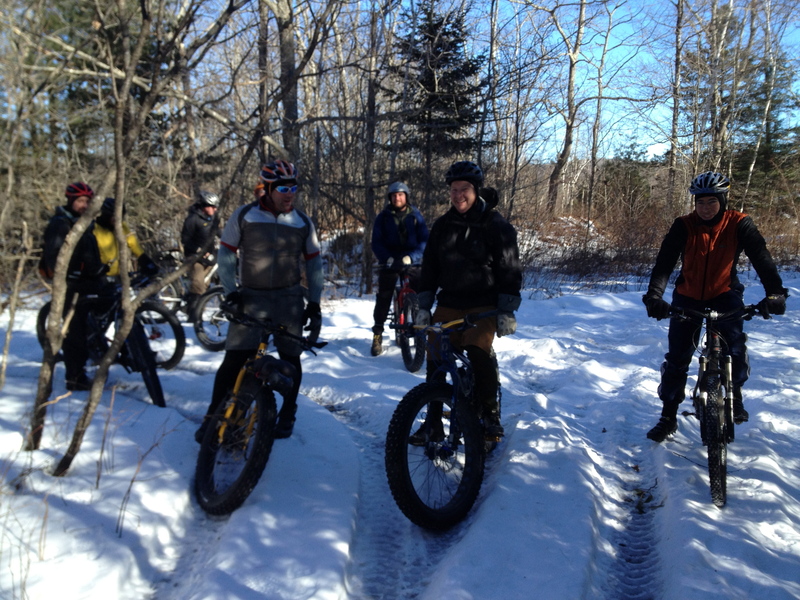 This week the training has been snowshoeing and mountain biking on the snow. Both are difficult. For a glimpse of my most training episode on Thursday night- check out this blog entry. One aspect of training that is not often spoken about is training for mental toughness. My wife believes I have a “Polish suffering gene”, and the following article from 2008 National Geographic Magazine gives strong evidence that she might be correct. On my next entry I plan to introduce companies and individuals that have agreed to help me out with gear and supplies. Riding in real cold, real dark, real steep, really difficult traction conditions in the Camden Hills State Park, overlooking Penobscot Bay under the last quarter moon. I don’t think it reached 15 out on the seven-plus miles tonight. Five Bubbas made it out with the help of the lights: four guys on fat bikes ( Ian, Jason, John, me) and Craig Mac on his Tallboy outfitted with a brand new pair of Ice Spiker Pro 29″ 2.25 Studded Tires. We left from the Route 1 Parking lot. The ride was most difficult right at the start, with an immediate climb of 400 feet in the first half- mile. Ian and Jason took right off and Mac and I rode together. The track tonight is not frozen in at all, despite five days of cold clear weather since the last snowfall. It’s a wide packed smooth snowmobile-graded skiing trail, wide enough to let the ski skaters fly along through the Park. Every once in a while, the 250 pound combined weight of me and the Pugsley broke through the top layer and started spinning a bit until the lugs on my Nate tires caught and on I’d move ahead. Craig Mac stopped a couple of times to dump air out of his tires. You need as much surface on the pack as possible in order to keep from sinking while you pedal. On the way up, John Anders came at us on his Pugsley from the Lincolnville end of the road, a mile and a half downhill from here. We caught Ian and Jason. Ian encouraged me to dump most of the air out of my 4” tires. I thought they were soft enough, as I had pumped them up to 9 pounds two weeks ago. He told me they were still too firm. A mere four pounds inside the tire didn’t sound like a good idea to me, but after I let the air out, I pulled up and away from Craig Mac, which NEVER happens. We regrouped at the 3.5 mile mark, at the start of the Bald Rock Mountain Trail, where the young bucks headed up and Mac and I doubled back. It was crazy fast and fun running down the long downhill. 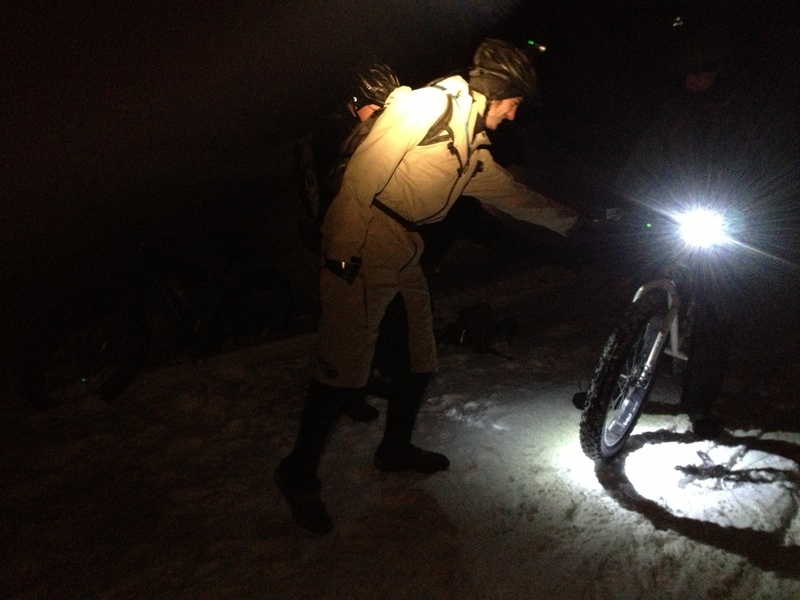 While the track was not frozen solid, it made it possible to lean the bikes over and keep rubber down as we twisted and skidded our way back to the parking lot. I’ve got to improve my footwear situation. I should of listened when Marcia told me to throw out these batteries,just because they were 6 years old.